I'll be reading the story "I'm Telling" today. They are words meant to strike fear in your siblings. Just wait til mom and dad find out about this! Then there will be trouble! But will this story strike fear into the hearts of its reader? Let's find out. Rathering that doing his art project Adam is in the woods playing pretend. He is hunting a stone gargoyle in a fountain using his trusty squirt gun. Sadly, he is out of ammo but the gargoyle begins to emit a strange green ooze from its mouth. Good enough! He fills the gun with it and is ready to go. Then his annoying little sister shows up. She is ready to rat him out for goofing off instead of doing his work. She informs him she is telling on him, repeatedly. Adam really has no choice but to blast her with the squirt gun. Rather than just being gross, the green goo has a strange effect. It turns his sister to stone. What to do what to do. He loads her up in a wagon and starts to cart her off. By pure happenstance his art teacher sees him and thinks his stone sister is an art sculpture he did for his project. Naturally she is amazed and tells him to bring it to the art contest before it's over. He wins first place. Well done. Now there is the problem of what to do with her. He decides ultimately to wheel her back to the gargoyle. It's not where he left it, it is in the air now, alive and ready to attack. He blasts it with the ooze and the beast returns to stone. Now he hears his sister statue beckoning for help. He has an idea. He squirts her with the gun and she returns to normal. Whew, all his problems are solved. Or maybe they aren't. His sister is rather upset about everything that went down and is threatening to tell on him again. Even though his parents probably wouldn't' believe the outrageous tale, she is pretty annoying... He squirts here again. Back to stone. Problem solved. Though I did appreciate the classic mummy in yesterday's story, it is always nice to get a fresh monster to read about. As far as I know, R.L. Stine has never done a gargoyle before. They are by nature kind of creepy but I wonder how familiar kids are with them. Do kids know what gargoyles are? 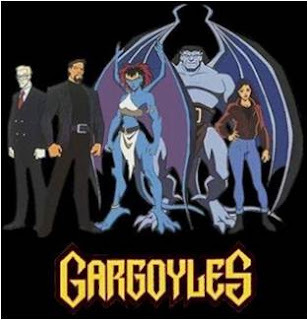 Since the Gargoyles cartoon isn't airing any more I'm not so sure! Somewhat like yesterday's story I think this one mostly works except with one complaint. This complaint is a little bit more minor this time though. I basically liked the plot, turning his annoying sister to stone is great. Entering her in an art contest is great. The gargoyle coming to life is fine. The problem is this, he did the exact same thing to bring her back to life as he did to turn her to stone. Does the Gargoyle juice just toggle the status of you being rock? That is weird and doesn't make much sense. Stine could have written something where the living gargoyle did something that result in her turning back. Perhaps if it had different spit while in living form that undid the liquid stone stuff while in its statue form? It seems like that would be a simple enough thing to do. 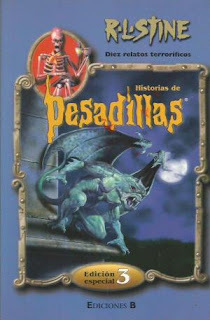 I think rather than the gargoyle itself the heart of this story is probably Adam and his little sister. People with siblings have probably at least been annoyed by them to an extent they wish they could just shut them up at some point. If you didn't have siblings there was probably a kid you knew you would like to turn to stone. It's a fun idea, and since it is a short story you don't have to do much with the potential ramifications. Yes his is worried about what will happen when people realize she is missing.. but not so much he doesn't want to turn her to stone again. Sisters can be that annoying. Despite the flaw I find in it I think this story is mostly enjoyable. If I was 10 I probably wouldn't even care about it. 33 year old me is grumpier about such things. I think perhaps just because a story is for kids doesn't mean you shouldn't use some care while crafting it. Still, it is not horribly detrimental. Tomorrow another bone chilling tale will be read. I'll be reviewing "The Haunted House Game." Haunted houses are usually scary. Games are usually not. How scary a haunted house game is will have to be determined I guess. We'll do so tomorrow.